Marks and Spencer has launched its “easy dressing” range for children with disabilities. The move is the first of its kind among high street brands, and is a huge step forward in inclusion and representation. The store has designed the clothes to be easier to put on and take off, with extra space for casts and hidden pockets for feeding tubes. All clothing is made with soft material, with clothing tags hidden or tucked away, so it can be worn by those with sensitive skin, too. Models for the range are children with disabilities, highlighting the company’s commitment to representation, and demonstrating the wide range of young people the line can be worn by. The clothes cater to children sizes from 0-3 months, all the way up to 15-16 years. 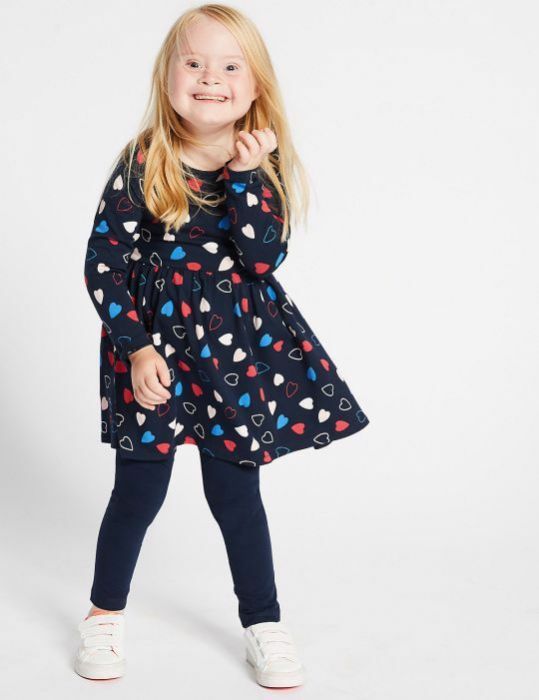 Pieces include long rise jeans, with extra room while wearing a nappy, or extra comfort while sitting in a wheelchair; shirts with riptape plackets behind the buttons, to combine style with ease; bodysuits with poppers instead of zips or buttons; and super-soft Disney Frozen pyjamas with Elsa on the front, with labels tucked away for no irritation. Many of the trousers and leggings also have inside leg openings, to avoid having to slip trousers on. Not only does the clothing line provide casual wear, but also specially adapted school uniform pieces, such as school shirts and dresses with velcro instead of buttons, and straightforward pull-up shorts, skirts and trousers, with zips and buttons removed. The clothing line has been met by huge praise on social media. Many have been requesting an adult range too, which the store has said it will look into in the future. With such a huge high street name making a commitment to inclusivity, it will hopefully be only a matter of time before other brands follow in their footsteps. Keep up to date on news and events by following us on Instagram and Twitter! Did you watch Silent Witness episode about care home abuse last night? Be the first to comment on "M&S reveals “easy dressing” range for children with disabilities"